White paper on crime 2001 Part 1/Chap.1/Sec.4/2. Under the partial amendment of the Public Offices Election Law in 1994, secretaries and organized election campaign managers of a candidate were additionally included in the scope of persons who are to be subject to the regulation holding a candidate jointly responsible. The regulation was strengthened as it became applicable to family members of a candidate, who had conventionally been subject to the regulation, even before the candidate formally stood in an election. It also became applicable even when a candidate was granted suspension of execution of imprisonment with or without labor. Furthermore, a candidate who was punished under the regulation was prohibited to stand as a candidate in next elections. Under the strengthened regulation, public prosecutors filed proceedings in 73 cases for conducting invalid elections related to the regulation. More specifically, 12 cases were filed for conducting invalid elections and prohibition of candidature and 61 cases were filed only for prohibition of candidature. Of these, the plaintiff won the suit in 72 cases (including cases in which actions were withdrawn due to lack of benefit of suit) (as of May 31, 2001), and in the remaining one case, the plaintiff lost the suit on the ground that the defendant candidate had already been judged to be subject to the regulation for a different reason. 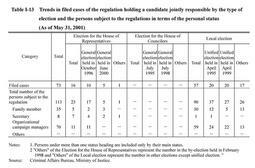 Table I-13 shows a breakdown of the relationship between candidates and the 113 persons who were subjected to the regulation to be exercised in 73 lawsuits filed by public prosecutors in elections. In local elections, a large number of lawsuits were filed despite the decreasing trend in the number of persons referred for Public Offices Election Law violations, and the number of persons who were subjected to the regulation to be exercised showed hardly any decline, which implies that vicious violations of the law were still persistently committed in this type of election.